If you are in a hurry and just want to know what the best double stroller for twins is, then out personal recommendation is the Graco Ready2Grow. A double stroller is a necessity for the growing family. Moving the kids around is never an easy task. The more room they have to move, the harder your life could be. Two kids roaming around on foot and getting curious about everything they see makes for a very slow and frustrating trip. We have tracked down the best double stroller on the market today to help you take advantage of this ultra convenient model stroller with our top five double strollers. Having twins or two children close in age can be a wonderful experience especially when you get to see them develop that bond. Each gets their own different personalities as they grow up so you need a solution that is most suitable for moving both of them. You can attempt the twin baby carriers if you are that way inclined, but this will be tough if you have children of differing ages to balance out the task. Plus carrying two children on a longer day is a very tough ask. This will only work if both babies prefer babywearing. There are huge benefits to babywearing, but it is just not practical for all occasions. Double strollers are an easier option and are a lifesaver when it comes to getting around with your little ones. Not only will it be more convenient for you, but it will also give your kids the comfort that they need. To determine the best double stroller on the market today we have focussed on value for money, weight, longevity, and maneuverability. The Graco Ready2grow is a super versatile choice for your little ones– it offers up to 12 different riding positions! This is ideal for both newborn babies and toddlers. This is compatible with 2 infant car seats. The front seat has multiple reclining options to make sure your baby is nice and comfy and the backseat offers face-to-face – or “FaceTime” as they call it – contact with your baby. It has a reclining seat, bench seat, and a removable platform that will definitely come in handy once your kids start to grow up. Graco keeps your precious ones safe by having 3 and 5 point safety harnesses with lockable wheels to make sure they’re not going anywhere you don’t want them to. The wheels also have built-in suspension that will glide over any bumpy and rough terrains and great maneuverability. It has an easy and quick folding and setting up method you can do with one hand. Other convenient features include: a large storage basket for other necessities, a parent tray with cup holders, a removable child tray, and 2 lined removable canopies you can attach when your babies need more sun protection and removed if they don’t need it. The front seat can hold about 50 pounds while the back seat holds 40 pounds. The back can be converted to a bench seat and platform for older children while the front seat can be converted to a bench seat, as well. This stroller will definitely last you well into your kids’ toddler and child years. The ZOE XLS DELUXE Double Xtra Light Weight Twin Travel & Everyday Umbrella Stroller System is probably the most lightweight stroller in the market today. It only weighs 16 pounds! The frame is made from aluminum which makes it super light but still has the stability and security of other, heavier strollers. It’s also smaller than a lot of other double strollers because it removes the unnecessary space between seats by seating both your kiddies right next to each other. You can rest assured that your child is safe in it with its 5 point safety harness, step-on brakes for each rear wheel, padded belly bars, and lockable wheels to make sure that your children aren’t going anywhere you don’t want them to. There are no compromises on safety despite the lightweight frame. Other notable features include: two child cup holders, one child snack tray, a quick folding mechanism for ease of storage and setup, two foldable sun canopies that will provide lots of shade from the sun, a large storage basket, a travel bag to easily store the stroller, and a quick folding mechanism for easy setup and folding. The wheels give a smooth ride over rough terrains with their front-wheel suspension and give you easy turns and swivels. The seats slightly recline so your kids can nap comfortably, however, you may want to get this one when your babies can hold their neck up or are about 6 months and older because of this and because the stroller doesn’t take infant car seats. Each seat can hold up to 50 pounds which means that this stroller can hold a whopping 100 pounds all in all. You can also choose from a wide range of colors to suit your taste. 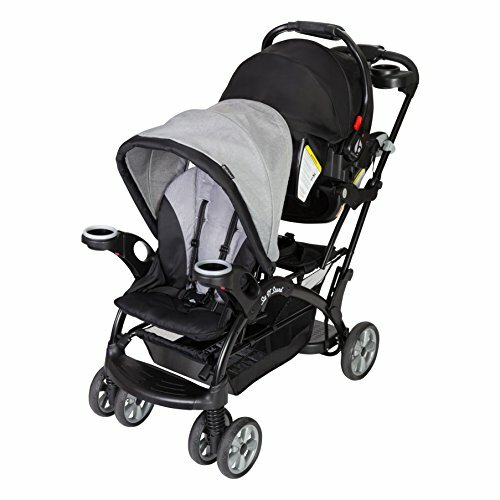 The Contours Options Elite Tandem Stroller can seat your babies in 7 different positions. Your babies can either face you, the world, each other, or one or the other facing you and the other facing outward. The seats fully recline so your babies can nap comfortably in it. It accepts two infant car seats and can be easily converted to accommodate once your kids start growing or if you have a slightly older child. 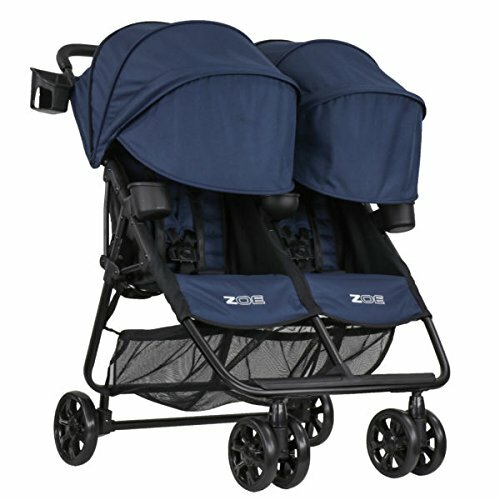 This is one of the best strollers for twins, but it can also work if you have your kids close in age. It guarantees your children’s safety with padded 5 point safety harnesses, padded swivel bumper bars, and a sandal-friendly brake pedal. Other features include a lift-assist grip for seat dismount, easy storage, folding, and setup, two foldable sun canopies to protect your kids from harsh UV rays, a large storage basket for other necessities, a parent cup holder, and adjustable leg rest. The wheels have a never-flat feature and front-wheels suspension that will make sure that your kids still have a smooth ride even on bumpy terrains and give you the ease of maneuverability. Each seat can handle 40 pounds of your kids, so you can use this until your kids are well and grown. 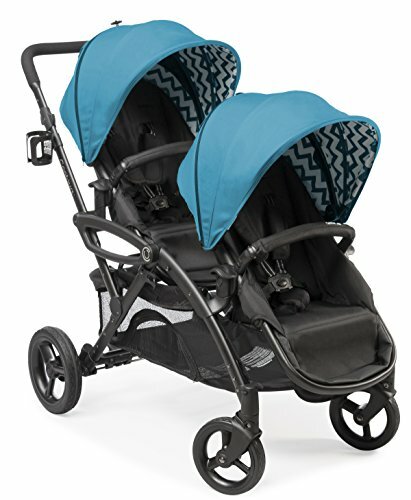 The Joover Scooter X2 Double Stroller is a great choice if you are looking for extra compactness. It seats your kids side by side and only has a width of 30” which means it can fit through just about any doorway! Both seats recline pretty far back with multiple positions and independently, however, it’s advisable that you get this when your kid/s are 3 months or older since it is not compatible with infant car seats. Your kids will be secure with the 5 point harnesses linked rear parking brake, and bumper bars. 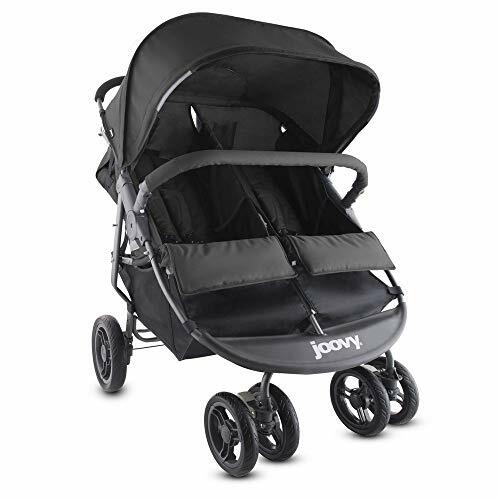 Other notable features include a large canopy for both kids to protect their sensitive skin from the sun, two parent cup holders, super large storage basket, an adult-organizer for phones, wallets, and other necessities you might want to bring on the stroller with you, one-handed and easy flat-fold and setup. The wheels offer extra stability and easy maneuverability, however, you may have to stay away from anything too bumpy or rough when it comes to strolling around with your little ones as this stroller doesn’t offer suspension. Each of the seats can hold 45 pounds and the overall capacity of the stroller is an impressive 90 pounds so you can definitely still make use of this as your kids start to grow up. The Baby Trend Sit N Stand Double Stroller has a front and back seat aligned behind each other. Placing the larger of the two children in the back seat will give both the best chance of having a good view of their surroundings. You also have the option of having the larger child on a standing platform at the back of the stroller if they are strong enough to handle this. Inside the main capsule, both seats allow for multiple positions. They can sit, lie down, and even stand and grab on once they get old enough and energetic enough. You’ll be glad to know that your little ones are very safe in the Baby Trend because of the 5 point harnesses, fixed seats, and a foot-activated parking brake which will make sure that your little ones are secure. The Baby Trend will also accept two infant car seats. Your babies will also be comfy with the reclining seats that you can adjust depending on what they need. Other convenient features include: a large basket you can put necessities in, removable/swing away child trays with cup holders to make feeding your babies while you’re out and about. Easier, canopies to keep your kiddies’ skin safe from harsh UV rays, and a one-hand fold which will make setting up and folding away this stroller a breeze. The Baby Trend can handle a bumpy or rough terrain with ease and still give your babies a smooth ride they can nap through and giving you the ease of easy turns. Each seat can hold up to 40 pounds of your kids, while the backseat can be converted to a jump seat or standing platform to fit the needs of a bigger child, so you can definitely get some long-term use out of this. With the double stroller becoming a staple for the average family you will be spoilt for choice. Much of the requirements to find the best double stroller for you will come down to personal choice. With modern safety standards high you preference may come down to the add-ons like storage space, and the ease of use of the design. Size and weight: You need to consider what will be the most common use of your stroller. If you are likely to spend more time in shopping malls than parks then you will be looking for a lightweight and maneuverable option to help you through the crowds. The good suspension will be less important as you will spend more time on smooth surfaces. If you will spend more time at the park then the suspension will be much more important and you will be after something a little more heavy duty. Safety: While this is a top consideration for all parents, it is worth noting that safety standards are high and are tightly enforced for all strollers on the market. All items that made our list of best double strollers all have a big emphasis on safety. This is the kind of item where you may not want to venture far from the larger brands for the sake of saving a few bucks. Budget: Speaking of a few bucks, there is still a wide range of price points on our list and you will be able to find something to suit. The Zoe XLS is the most expensive stroller on the list, and deservedly so. It is a luxurious stroller to use, and for your kids too. You do not need this for a practical solution though. The Baby Trend Sit n Stand will do just fine for most uses and comes in at a much cheaper price point. Our choice for the most reliable stroller, from a big name brand, at an affordable price point is the Graco Ready2grow. We like the versatility that the stroller provides and the fact that it is car seat compatible. It is a clever design and has all the features and storage space you will need. If you prefer the side by side model, then the ZOE XLS DELUXE Travel Stroller is a no-brainer. The extremely light frame and feature-packed stroller are worth every dollar for those who are a bit smaller and find the larger framed strollers to be a bit heavy. You will find the Zoe XLS to be a breeze to get around with. PrevPreviousBaby Carrier Vs Stroller – The Size, Strength and Mobility Showdown!